The picturesque Lake Königssee ("King′s Lake") in Bavaria is only a few minutes drive from Salzburg and a very popular day-trip destination. It is situated just across the border, in Germany′s most southern-east corner, in the National Park Berchtesgaden. As such, Lake Königssee is surrounded by some of Germany′s most dramatic mountain sceneries: Mount Watzmann and its steep cliffs surround Lake Königssee almost everywhere around its shores. The only exception is one corner, from where the Königssee Ache Creek emerges. The steep cliffs around Lake Königssee continue under water. In fact, looking at the surroundings of any lake usually gives you a pretty good estimate how deep it is: Flat surroundings hint at shallow lakes, steep cliffs at deep waters. This perfectly applies with Lake Königssee: With a maximum depth of 190 metres, Lake Königssee is the deepest lake in all of Germany. All that with a relatively small surface area: Lake Königssee is 7.7 kilometres long, but only 1.7 kilometres wide. The origins of Lake Königssee date back to the last Ice Age, when essentially all of the Northern Calciferous Alps was covered by mighty glaciers. Once the withdrew, the glaciers left large chunks of ice that melted and gave rise to lakes - one of which was later called "Lake Königssee". That much about the scenery. 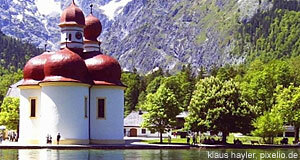 In terms of sightseeing, Lake Königssee has a lot to offer, too. The main community by the lake is Schönau am Königssee, a small, traditional Bavarian, but touristy town. The monastery of St. Bartholomä is a gem of Southern German Baroque art and a popular postcard motive. The church of pilgrimage has attracted international attention for many centuries. Today, tourists often come to Lake Königssee for boat cruises. This comes with constraints, though: Lake Königssee is the cleanest of all German lakes, and in order to preserve its purity, fuel motor boats are banned. Cruises therefore are done with electric or mechanic boats. This involves rides on so-called "Zillen" or punts. These punts are not driven by a pole like in the Salzkammergut (or Cambridge), but with paddles - obviously, because Lake Königssee is too deep for a pole. Tour guides in traditional costume often sing folk songs or play trumpet or horn to demonstrate the amazing echo that you can generate on Lake Königssee due to the rocky cliffs around it. Speaking of these: The mountains of National Park Berchtesgaden offer innumerable opportunities for hiking, mountain biking or Nordic walking - among other alpine sports. No wonder Lake Königssee is so packed during the summers - it is probably one of the most rewarding day-trip destinations from Salzburg. There is also the Eagle′s Nest / Kehlsteinhaus of Hitler nearby.